This weekend I made a few significant upgrades to groovyPost.com. All but one should be invisible to the readers. However, if anyone notices any “funny” behavior on the site, please let me know ASAP either here on in the Forum. 1) The first change this weekend was cutting over from SEO Title Tags to the All in One SEO Pack. Being that this is a large contributor to the overall SEO of the site, this was fairly significant. Although SEO Title Tags has been working well for several years now, I believe I’ll receive more SEO benefit from All in One SEO Pack. Time will tell. The cutover was rather painless. However, testing consumed the most time. The one thing missing from All in One is the ability to customize the Title Tags for any Misc. URL on the site as well as the Category pages. Being that I don’t allow indexing on the Category pages, this was no loss. The Funny thing is, two hours after I installed the new Plugin, a NEW version of All in One SEO Pack was released (1.4.7.4.) If anyone attempts a migration like this, I HIGHLY recommend making a backup of their system first. I ran into an issue where several Categories deleted, (still don’t know how that happened) which of course changed my URLs to several articles. 2) The second change to the site was the install of WP Super Cache. As the popularity of the site has been increasing, so has the load on my backend Database. Over the next several weeks I’m looking forward to snapping some metrics to see how the Caching will impact the mySQL backend. Again, this should be an invisible change to all our readers, so this is more of an FYI. 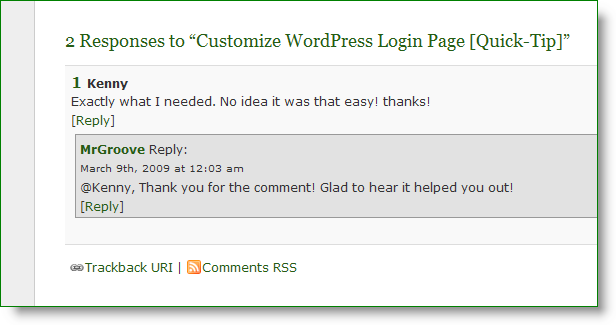 3) Last but not least, I’ve decided to add a bit more functionality into the Comment system on the main site and here on my blog by implementing WordPress Threaded Comments. It’s helpful for keeping track of a conversation and responding to individual comments or questions. And, as always, please try to keep the questions to a minimum in the Comment sections. Instead, leave the bulk of the Technical (or life in general) questions in our free Community Tech Support Forum. This way other groovy readers can answer your questions. Plus, the forum is perfect for keeping track of questions and conversations. Unfortunately, I don’t always notice a new comment. That ends this special announcement. Please feel free to return to your groovy reading! @MrGroove, yeah dude i like it. Looks good! I cant say I can actually see a change except for the comment system. But I defiantly like the threaded comments. Very cool! @MrGroove, Threaded comments are nice and I like the implementation. I still prefer to keep long discussions in the Forum tho. Easy for me to help out there. Comments just get to messy on wordpress blogs.